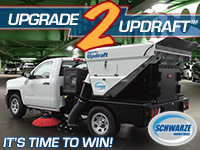 Welcome to WorldSweeper.com's special coverage of the 2019 National Pavement Exposition, which was held in Nashville, Tennessee in February 26th – March 2nd. We decided to focus our entire March edition this year on information we picked up at the National Pavement Expo (NPE). If you attended, the information will serve as good reminders. If not, you will have an opportunity to see a small slice of the value a tradeshow of this type has to offer. For our municipal readers – and because I've long been a believer in sweeping contractors providing auxiliary services in addition to their core service – we've included video interviews with some non-sweeping vendors of interest. Though the expense to participating vendors largely funds a show like NPE, in my opinion an even better attendee value is in the seminars. Those – along with the 'conversations in the bar' that take place among attendees – are the places where real learning takes place. NPE is also a place where awards of merit are bestowed and we're pleased to bring the presentation of several of those to you, as well. We start with the WorldSweeper/World Sweeping Association's annual Award of Excellence in Power Sweeping , which is a tradition I began in 1995. 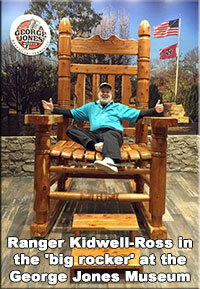 We have videos with over a dozen vendors who were displaying at this year's NPE. Unfortunately, I picked up a bug and had to miss the last day of the show floor, so we missed doing video walkarounds with several major sweeper manufacturers. We offered to link non-show videos for those companies, though, and as you will see several took us up on it. Our World Sweeping Association is proud to sponsor several seminars each year and we appreciate NPE's willingness to allow us to film those for our non-attending WSA Members. It is my belief that ongoing education on all aspects of running a business is the best, and perhaps only, way to keep up with the emerging business methods that allow for growth and prosperity. Our coverage this year also includes a photo slideshow of some of the equipment and sweeping industry people attending the show, which will give non-attendees another glimpse into what they missed. If you went to NPE this year, I know the slideshow will bring back fond memories. In any event, now is the time to start planning to attend next year in Nashville, January 29th - March 1st, 2020. PS We welcome and thank our three new newsletter advertisers, Curbtender Sweepers, LLC; Canada's Sweeprite by Merit; and, Finland's Trombia Sweepers. Louisiana-based Clean Sweep, Inc. Wins Award of Excellence in Power Sweeping. 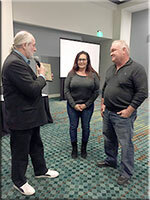 The photo to the right shows our editor, Ranger Kidwell-Ross, presenting this year's WorldSweeper.com/World Sweeping Association Award of Excellence in Power Sweeping to Bridget and Warren Burge, owners of Louisiana-based Clean Sweep, Inc. The couple started sweeping in 1990 via purchase of a Schwarze model 347-I sweeper. The firm has since grown to where today the company owns and operates a fleet of 30 vehicles, 25 of which are sweepers. They are a major force in Louisiana sweeping and pavement maintenance, where they sweep warehouses, construction sites, city streets and, yes, still continue to sweep parking lots. In addition, the Burges have built a 'one call does it' company that can handle virtually any type of pavement and exterior maintenance, including infrared asphalt repair. In addition to being a Founding Member of the World Sweeping Association and a member of the North American Power Sweeping Association, theirs was the first – and so far only – company in Louisiana to receive the latter's Certified Sweeping Contractor designation. The Award was given out during the 2019 NPE Sweepers' Roundtable. Use this link to check out our complete presentation information for WorldSweeper.com's annual Award of Excellence in Power Sweeping . Contract Sweepers and Equipment, an employee-owned company, wins NPE's Sweeping Contractor of the Year. Here is the brief video of the award ceremony, at which Gerry Kesselring received the award from Amy Schwandt, Show Manager for NPE. Play the video by clicking on it or, to see this video at full size at YouTube.com, go here (opens in a new browser window). You can also read more about Contract Sweepers and Equipment in the article done by PAVEMENT Maintenance and Reconstruction magazine. 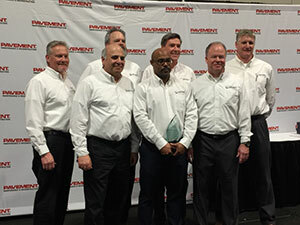 Mark Carter was honored at the 2019 National Pavement Exposition as the winner of Emerald Production's 2019 Alan B. Curtis Industry Service Award. Here is the brief video of the award ceremony, at which Mark Carter received the award from Allan Heydorn and Amy Schwandt, Show Manager for NPE. Play the video by clicking on it or, to see this video at full size at YouTube.com, go here (opens in a new browser window). You can also read more about Mark Carter in the article done in PAVEMENT Maintenance and Reconstruction magazine. Allan Heydorn received two awards honoring his service to the pavement maintenance industry. Allan Heydorn, longtime Editor of PAVEMENT Maintenance & Reconstruction magazine as well as the Seminar Manager for the National Pavement Expo, received two awards honoring his length of professional service to the pavement maintenance industry. Here is the brief video of the award ceremony, at which Allan received his awards from Amy Schwandt, Show Manager for NPE and Russ Turner, Associate Show Director for Emerald Productions. Play the video by clicking on it or, to see this video at full size at YouTube.com, go here (opens in a new browser window). Click on the video link shown below to access the entire slideshow, which runs for about 4 minutes. To see this video at full size at YouTube.com, go here (opens in a new browser window). We offer videos taken at the 2019 NPE of the manufacturers with products of most potential interest to our sweeping industry readership. You can see these, displayed in alphabetical order, below. Unfortunately, due to our editor catching a flu bug he was unable to film video walkarounds on the last day the show floor was open. We contacted affected suppliers with an offer to link to any video they might have on the model(s) they had on the show floor and/or we linked previous interviews we had conducted with them. Fortunately, this strategy allowed us to include most of the sweeping-related companies with equipment that were at NPE. Editor's Note: Since the 1-800-SWEEPING video was scheduled for Friday we were unable to video. The following video interview is from a previous NPE. Mike Musto, founder of the 1-800-PAVEMENT Network, explains his concept of assisting contractors in promoting their businesses. Although there are a number of pavement maintenance industry 1-800 names available through Musto's network, the information shown emphasized the 1-800-SWEEPING name now being made available. For more information click here. To see this video at full size at YouTube.com, go here (opens in a new browser window). Brian Singer, representing Buffalo Turbine, discusses his company's product line. 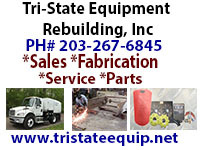 For more information call at 716-592-2700 or visit the company's website, http://buffaloturbine.com/. To see this video at full size at YouTube.com, go here (opens in a new browser window). Editor's Note: Elgin Sweeper was one of the companies we missed videoing on the show floor. Thanks to James Crockett, Elgin Product Manager, for providing us two video links to the company's Crosswind model. The first Crosswind video is a YouTube compilation, which was released on March 5th, that utilizes the Crosswind to show the major market touch-points for single-engine technology. To see this video at full size at YouTube.com, go here (opens in a new browser window). Otherwise you can watch in smaller size below. Another video provided by Elgin is an informative three-minute explanation of how the Crosswind1 technology works in providing a variable output to the sweeping functions of the sweeper. To see this video at full size at YouTube.com, go here (opens in a new browser window). Otherwise you can watch in smaller size below. Contact Elgin Sweeper by calling 847.741.5370. The company's product line is represented by dealers throughout the U.S. For more information, we suggest you contact the Elgin dealer nearest you. Elgin's website is www.elginsweeper. Tony Lucas, VP of Sales, discusses Firmhorn's product line at the 2019 NPE show. The small Firmhorn sweepers are a much faster and more thorough way than a broom and dustpan to clean up warehouse floors as well as prior to striping. Contact the company by calling 805-874-2242. The company's website is www.firmhorn.com. To see this video at full size at YouTube.com, go here (opens in a new browser window). Jason Schechtman discusses the value of using Integrated Vehicle Leasing when you purchase vehicles and other capital equipment. For more information call at 631-439-1266 or visit the company's website, www.integratedleasing.com. To see this video at full size at YouTube.com, go here (opens in a new browser window). Johnston Sweepers' Product Marketing Manager, Matthew Starnes, discusses Johnston's products during the 2019 National Pavement Exposition. For more information about Johnston Sweepers call (704) 658-1333 or visit the company's website, www.johnstonsweepers.com. To see this video at full size at YouTube.com, go here (opens in a new browser window). Little Wonder's Rose Becker discusses that company's product line of versatile blower products during the 2019 National Pavement Exposition. For more information about Little Wonder call 877-596-6337 or visit the company's website, www.littlewonder.com. To see this video at full size at YouTube.com, go here (opens in a new browser window). John Day discusses both the Nitehawk's Raptor and Osprey models at the 2019 NPE show. To see the Osprey video at full size at YouTube.com, go here (opens in a new browser window). To see the Raptor video, shown below, at full size at YouTube.com, go here (opens in a new browser window). At the 2019 NPE Nitehawk also unveiled its new sweeper game where you don't need a sweeper truck to play – just your phone. "Sweeper Madness" is NiteHawk's new free mobile game that was just released on Android and IOS and takes sweeping to the extreme! Sweeper Madness puts you in the driver's seat as you dash to the finish line and collect as much trash as possible before you run out of fuel. Collecting trash gives you extra points to upgrade your truck, unlock crazy new sweepers and exotic locations. Ever think you'd be lucky enough to sweep a top secret military facility like Area 51? Well, in this game you can! You can download the app for free on either Google Play or on Apple's App Store. Be sure to check out Sweeper Madness! Contact the company by calling 800-448-9364. The company's website is www.nitehawksweepers.com. Proview Systems' Managing Partner, Nick Natale, discusses that company's product line of GPS fleet tracking technology during the 2019 National Pavement Exposition. For more information about Proview Systems call 865-769-6540 or visit the company's website, www.proviewsystems.com. To see this video at full size at YouTube.com, go here (opens in a new browser window). Jody Moses and Cees van der Put provide an informative video explanation of Scarab's full vacuum street sweeper, built onto a Peterbilt chassis. Scarab is part of the Fayat Group, one of the largest sweeper manufacturers in the world. To see this video at full size at YouTube.com, go here (opens in a new browser window). For more information call Cees van der Put at 262-725-4210, c.vanderput@ravo.fayat.com or visit the company's website, www.scarab-sweepers.com. Editor's Note: Schwarze Industries was one of the companies we missed videoing on the show floor. Thanks to David Heigl, Schwarze Marketing Director, for providing us with a video link to a video the company made of its Supervac Super Updraft model. This video of the Schwarze Supervac Super Updraft model illustrates its capabilities. To see the video at full size at Vimeo.com, go here (opens in a new browser window). For more information call at 800-879-7933 or visit the company's website, www.schwarze.com. Editor's Note: Stewart-Amos was one of the companies we missed videoing on the show floor. Thanks to Frank Chulick, Stewart-Amos' President, for providing us with a video link to a video the company previously made of its R4 model. This video of the Stewart-Amos R4 model illustrates its capabilities. To see the video at full size at YouTube.com, go here (opens in a new browser window). For more information call at 800-482-2302 or visit the company's website, www.stewart-amos.com. Antti Nikkanen, Managing Partner of Trombia Global, provides an informative walkaround of his company's innovative sweeper, which attaches to most front-end loader models. The multi-patented machine is a mechanical broom with "Airknife" air assist; offers PM 2.5 certification; suppresses dust without the need of water; and, there are no filters to clean. The machine had its U.S. debut at the National Pavement Expo. You may view a press release about the Trombia sweeper here on the WorldSweeper.com website. For more information about Trombia call 718-690-9287 or visit the company's website, www.trombiaglobal.com. Monte Countess walks viewers around Victory Sweepers' Mark III model air sweeper. For more information about Victory Sweepers call 844-4-SWEEPER (844-479-3373) or visit the company's website, www.victorysweepers.com. Editor's Note: Well Made was one of the companies we missed videoing on the show floor. Thanks to Wells Leger, Well Made's President, for providing us with a video link to a video the company made for this edition of the newsletter after returning from NPE. For more information about Well Made Manufacturing call 602-323-2655 or visit the company's website, www.wellmademfg.com. The World Sweeping Association sponsored three seminars at this year's National Pavement Exposition. By arrangement with NPE management, WSA is allowed to videotape the presentations. However, the agreement requires that the videos only be made available to Members of the World Sweeping Association. Unfortunately, we were able to video only two of the seminars this year. As a courtesy to WSA Members, the two seminar videos, each approximately 1.5-hour in length, are linked below. However, even if you are not a WSA Member, you may still download each speaker's NPE handout on their topic. Become a WSA Member Today! Many product and service discounts, including parts discounts with Elgin Sweepers, Schwarze Industries, Victory Sweepers, Sweeper Parts Sales and many more. All new WSA memberships are offered with an unconditional money back satisfaction guarantee. Click here to apply. Pursant Inc. is an investment bank that also builds the value of your business. Mark Herbick, principal at Pursant, is an expert on assisting businesses in developing the targeted data needed to maximize the value of their business when it's time to sell. In this seminar, Herbick lays out the guidelines and information you need to get the process of value maximization rolling in your sweeping and pavement maintenance business. He also talks about how to track the best time(s) to sell a business. Even if you are not a WSA Member, you are welcome to download and view Mark Herbick's handout that was provided to NPE attendees. If you are a WSA Member, click here to access the video at the WSA website. To contact Mark Herbick, go to www.pursant.com/, send email to mherbick@ pursant.com or call 847-229-7000. The presentation by Gary Rabine of Rabine Paving, accompanied by Quinton James of True Mentors, focused on the value of mentorship – both giving and receiving. The duo discussed the correct and incorrect ways in which to mentor others, which also translates into how to receive advice from your own mentors. In 37 years, Rabine Paving has gone from a startup paving driveways to a large, full-service paving company with over $200 million in annual sales. Gary Rabine credits mentorship for creating a positive growth climate for business owners via both giving and receiving. The viewer receives information about places to go in order to receive mentorship that will enhance their ability to lead their organization to new heights. Even if you are not a WSA Member, you are welcome to download and view Gary Rabine's handout that was provided to NPE attendees. If you are a WSA Member, click here to access the handout and video at the WSA website. To contact Gary Rabine, go to www.rabinegroup.com or send email to garyrabine@ rabinegroup.com. You may reach Quinton James via the True Mentors website at www.truementors.com or send email to quintonjames@ truementors.com. You Want Change? Here's How to Make Changes Stick! Unfortunately, we were not able to video the presentation by Bill Silverman, owner of Springboard Business Coaching. Bill and his company specialize in coaching contractors with multi-million dollar businesses who feel challenged by the demands of running a complex multi-million dollar business and who know that they have untapped potential in their business that they just can't seem to harness. The company helps its clients restructure their businesses, learn new management skills and implement the strategies needed to sustain a thriving, profitable multi-million dollar business – along with a balanced life. Although we don't have Bill's seminar video available even to WSA Members, all of our readers are welcome to download and view Bill Silverman's handout, which was provided to NPE attendees. The handout is available in either the original Powerpoint version or as a PDF file. Bill also provided us with his handout for another popular seminar he presents, "How to Build Your Management Team and get the Best From Your Managers." The seminar notes are available here as a PDF file. Note that by going to the Springboard Business Coaching website you can also sign up to receive a FREE e-book entitled "The 5 Critical Success Factors for Running a Great 7-Figure Contracting Business." To contact Bill Silverman with your questions or to arrange for business coaching through his organization, go to www.springboardbizcoaching.com/, send email to wsilverman1@comcast.net or call him at 856-751-1989. That concludes WorldSweeper.com's Coverage of the 2019 National Pavement Exposition. Thanks for 'attending' the show with us!